Just about four years ago, an acupuncturist ordered me to make myself a pot of oxtail soup. I was about to bring my third child into the world, and I was tired. Every part of me ached, my winter coat no longer zipped over my belly, and the big, wise boy I was carrying was doing everything he could to avoid January in New York City; he stayed put for two extra weeks. I never did make that oxtail soup, but I always meant to, and there have been plenty of times when I could've used a bowl. The recipe Nana described to me was dead simple: simmer the oxtails gently for an extended period and season minimally at the end. That was it. Recently, I asked my friend Min—who, like Nana, is from Korea—if she had a similar version. Turns out, she does, and she was just about to make some. To my text query she replied: “Oxtail soup recipe is really simple but your house will smell like a 🐮.” Later, she sent me a video of the brew bubbling away furiously on her stove like a jacuzzi. Min begins by soaking the oxtail to leech out the blood, then simmers the soup for two days, pausing overnight and adding back water to offset evaporation. The resulting broth is rich, milky, restorative. She seasons it with just salt, pepper, and scallions and uses the base for dumpling soup or ramen. The excellent cookbook A New Way to Dinner, from the Food 52 team, contains an oxtail stew recipe of a more Italian flavor. As I set about cooking my first oxtails, I contemplated which route I wanted to take. I liked the purity and simplicity of Min’s and Nana’s version, the notion of allowing only time and hot water to coax the flavor and nutrients out of the meat and bones. When making stews, I usually take a rustic French approach, building flavor with lots of vegetables and aromatics and wine, the result being thick, dark, rich, and just a bit tomato-y. In the end I hewed to the familiar, because I wanted a heartier meal, one whose leftovers might be made into pasta sauce the next night. I started with meat from my favorite butcher, Fleishers, which sources humanely raised animals from New York State and can typically supply any part of the beast you'd like. At many good butchers, Fleishers included, you'll probably need to order the oxtail ahead of time; ask the butcher to cut the tail into segments along the joints. The size of the oxtail pieces will vary widely—just imagine a cow's tail (or don't) and you'll see why. Some were quite large, almost like osso buco. I recommend soaking them for a little over an hour to leach out impurities and blood. Be patient with the browning process, because it really does make a huge difference, and at the end of your long, slow braise you'll have intense flavor and richness. This is the sort of dish that benefits from a couple of days' rest in the refrigerator so the flavors meld together and the meat is truly falling off the bone. Don't be alarmed by the way the liquid congeals when it's cold, either—this is due to all the good gelatin and collagen that have infused the broth, and which will lend it a silky consistency. We'll enjoy this in Vermont this weekend as we build a fire with friends, play in the snow, and purposefully tune out current events. It's comfort in a bowl. Put oxtails in a bowl and cover with cold salted water. Let soak in the refrigerator for 1-2 hours. Once soaked, remove them from water and dry each piece thoroughly and sprinkle the surface with salt and pepper. Using kitchen twine, make a little bundle with the rosemary, bay leaf, parsley stems, and thyme if using. Tie securely. Preheat oven to 325°. 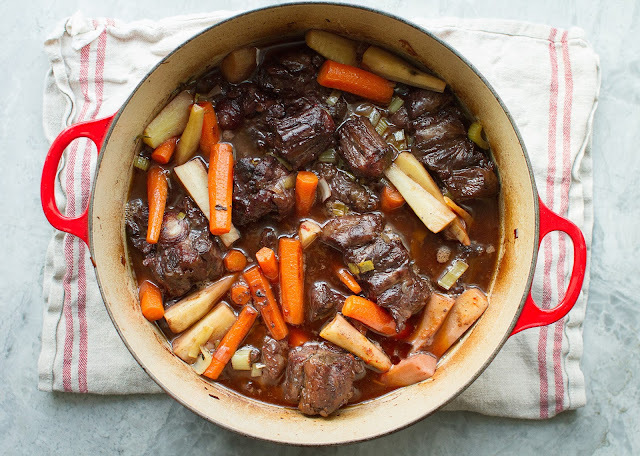 In a larch dutch oven or heavy pot, heat the olive oil and brown the meat on all sides, taking care not to crowd the pot (pieces should not touch) or burn the bottom. As each piece is browned, remove it to a platter. Once you've browned the meat, pour off all but a couple tablespoons of the fat (there may be quite a bit). Put chopped leeks and onions into the pot and sauté them for a few minutes, until they're starting to wilt, then add carrots and cook for a few more minutes. Remove vegetables to a bowl—you will add them back, along with the parsnips (which soften faster), later in the cooking. Return meat and juices, plus the herb bundle you made, to the pot and pour the wine and stock over it. Meat will most likely not be fully covered. Bring the liquid up to a boil, lower to a simmer, and allow to simmer uncovered for 10 minutes or so. Put the top on and transfer to the oven. Every 30 minutes or so, turn and rearrange the meat so all surfaces get a chance to be submerged. After about an hour, add the vegetables, including the parsnips and garlic, into the pot. Stir in the tomato paste. Continue to cook in the oven, rotating meat and vegetables occasionally, for a total of around 3½ hours. Add the orange rind in the last hour or so of cooking. Once it's done and fork tender, taste the broth and add more salt, if it needs it. Either serve immediately or allow to cool somewhat at room temperature before transferring to a storage container and putting in the fridge to serve later. 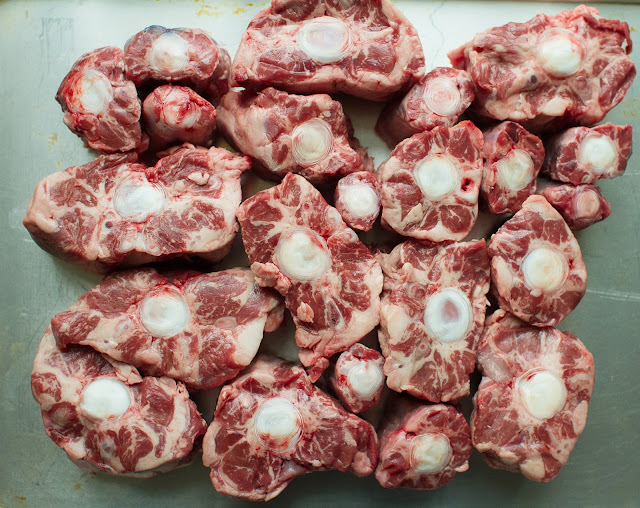 The oxtails can be refrigerated for up to four days, benefitting from the rest, and also freeze nicely. When chilled the fat will rise to the top, where it is easily scraped off and discarded. Before serving, remove herb bundle and orange rind. You can serve meat right on the bone or shred it and serve it with broth and vegetables. Serve hot over egg noodles or on its own with good, crusty bread. Optional: make a gremolata with chopped parsley, minced garlic, and lemon zest, and salt to taste; sprinkle on top just before serving.